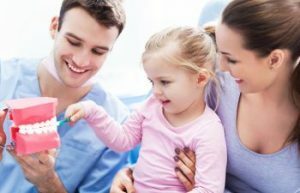 Is Your Child Ready for Their First Dental Visit? Thinking it’s about time to schedule your child’s first dental checkup? If you wait until your child has a toothache, then they may be overdue, already. Children should see a dentist by the time they are a year old or when they get their first tooth, according to the American Dental Association. At such an early time, you can make sure that your baby’s smile development is all happening on schedule. A Kennestone pediatric dentist will also teach you effective methods for cleaning your toddler’s teeth as they come in. Your child’s first dental visit doesn’t have to include x-rays and a professional cleaning. It’s usually just a consultation and an opportunity for your family to get to know the dentist. The sooner you bring your child to the dentist’s office, the sooner it will become a habit for them. They’ll be more likely to remain calm and cooperative during future visits. It’s one thing for a dentist to check a small baby’s teeth. But what if your child is well past the toddler years? Some children don’t handle their first trip to the dentist’s as well as others. But there a few things you can do to make the experience a positive one for your child. Be upbeat when talking about the dental office. Avoid expressing any negativity, even when mentioning your own appointments and treatment. Maintain a healthy routine of brushing and flossing your child’s teeth. Let your child watch the dentist examine your or an older sibling’s teeth. For more advice on keeping your child’s smile healthy, contact our team here at Dental Care Center at Kennestone.